How to use Sentiers offline? How well are Swiss borders covered? How to find hikes in the neighborhood? How to know the time left to arrival? How to change an itinerary on the map? 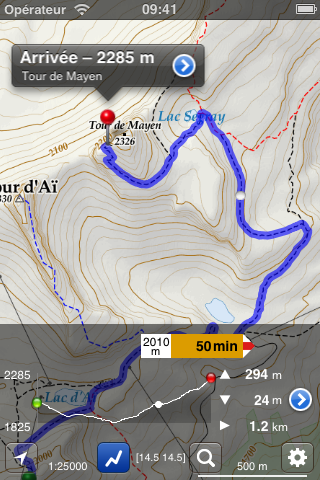 You can download maps and trails in advance for an offline use. This is done in the settings or from any itinerary detail page. Not well enough. Places and trails outside of Switzerland are not covered. This will be improved in a next release. Sentiers searches first in the places stored on your device: the results of past searches and in a future release the data downloaded for offline use. This is close to how Apple’s Mail app works. 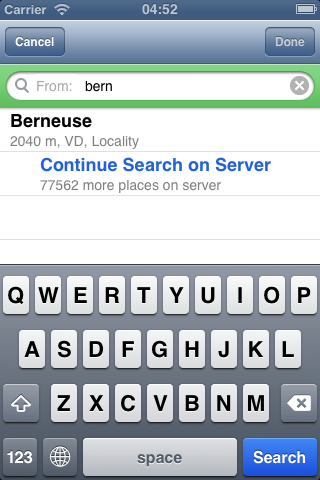 With Sentiers you can find published hikes, or hikes shared between users. These are listed in the “Shared” tab of the Search bookmarks. They can be sorted by distance, as the crow flows, from your current location or the selected place. Recent itineraries are automatically saved. They can be retrieved from the “bookmarks” button of the search page. 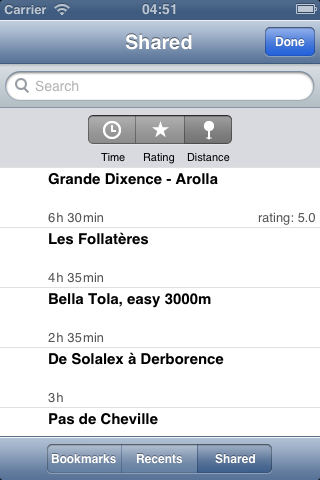 Itineraries can also be marked as favorite and retrieved in the same way. See also How to use Sentiers offline? At this time Sentiers does not permit to download maps and trails in advance for an offline use. You can move a cursor on the profile and all the information is updated for this position, displayed with a white dot. The current location is also displayed on the profile (blue dot) but it is approximate. To save battery sentiers do not track your position and therefore cannot know, for a return trip for instance, on what point of the profile the current location is. 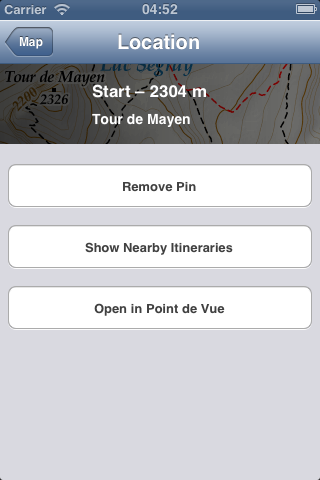 An itinerary can be modified by dropping and moving an intermediate or via point on the map. Touch (shortly) the blue itinerary to add an intermediate point. press on the pin to move it. In the settings button the “Report a problem…” action can be used to compose an email to us. Please take the time to add a description of the problem. This helps up to make Sentiers better.